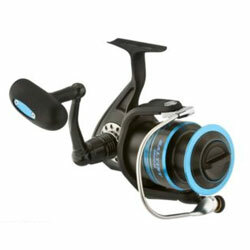 Daiwa's no-nonsense Saltist Spinning Reels are for all-out serious saltwater fishing. There are no flashy gizmos to get in your way—just solid, straight-ahead design features to get the job done. All-metal construction. Ultra-strong and smooth DigiGear digitally designed and machined gearing. Tubular stainless Air Bail with TwistBuster 2 and rotor brake. Five CRBB ball bearings. Sealed drag. Dual full-time anti-reverse. Left/Right-hand retrieve. And a machined-aluminum handle for leverage. Advantage: you.